Nottingham Forest may be 10 league places below Derby County in the Championship, but are in a much better position to beat their East Midlands rivals on Sunday. The Reds are currently oozing with confidence having extended their unbeaten run to five in the league on Tuesday night away at Norwich and are finally starting to find their rhythm. This is something they can use in their quest for local bragging rights. Unlike Forest, Derby are going into the game with an unwanted form, only winning once in their past nine league games and have lost their grip on an automatic promotion spot. They have slipped down from second place into fifth and are only four points away from dropping out of the top six. It may be argued that form gets thrown out of the window in a local derby but confidence does not and its clear from recent results which team possesses the most. The Reds camp seems to be an extremely positive one in recent weeks, something that was hard to say only a few months back. They have also recently found their scoring boots, netting seven goals in their past three games which is something they can hope to carry on through Sunday. As previous match-ups have proven, the derby games are often a goal fest with regular end-to-end action, but the Reds have often been on the wrong end of the goals scored but with several of their players getting a taste for goal they will try to set that right at the weekend. Forest’s attacking trio of Lee Tomlin, Joe Lolley, and Matty Cash have been the biggest contributors in front of goal recently, netting six of their side’s seven goals and will be key for the team on Sunday. They all pose a real threat going forward and latter two had opportunities to earn all three of the points against Norwich last night but were unfortunate. The academy graduate, Cash, has finally found his scoring boots for the side scoring his first professional goal against Queens Park Rangers two weeks ago in a 5-2 win for the reds. He then followed it up with what later would be the winner with another goal against Birmingham City in a 2-1 win last weekend. The goals have injected Cash with an extra confidence boost and will make him another threat that the Rams will have to deal with on Sunday. But the biggest trouble the opposition will have to learn to cope with is Lee Tomlin. Tomlin has had a dream start to his Forest career so far, scoring three goals in six appearances for his new team and is the biggest source of the team’s attacks. Tomlin missed out on the Norwich game last night due to fatigue and a minor calf problem but Aitor Karanka and the Forest faithful will be hoping that he is fit enough to help the side earn a much needed three points at the weekend. The Reds have also seemed to have found a reliable back four that has kept two clean sheets in their past four games. Tobias Figueiredo and Danny Fox have become an unlikely centre back partnership and are improving in every game and despite the returns of Michael Mancienne and Joe Worrall they should be the starting in the back on Sunday. The defence has also been bolstered by Tendayi Darikwa who has finally shown the City Ground what he can bring to the side. Having won his place back in the starting line-up, the summer signing has rarely put a foot wrong for the Reds and hopes are he can continue his impressive form at the weekend. It’s not just the recent results that can play a major part in confidence heading into the fixture but who that results came against. Derby drew 1-1 away at QPR last night, a result that amused the Forest faithful as the Reds came out victorious only 11 days ago at the same ground as they romped to a 5-2 win. 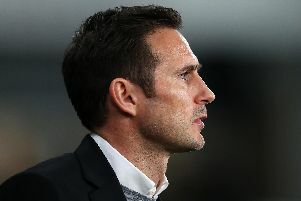 The Rams only managed one goal and one point against The Hoops whereas Forest managed five goals and the three points. This may be a factor that motivates the fans more than the players but in a game where the support is key, results like this can make a massive difference.